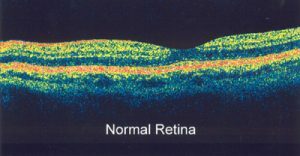 Optical coherence tomography (OCT) is a retinal scan used to study the anatomy of the retina in fine detail. OCT testing requires dilation of the pupils but does not require a needle in the arm and does not involve touching the eye. A healthy retina is only ¼ of a millimeter thick, but it contains multiple layers of specialized cells. One layer converts light into nerve signals, another processes the nerve impulses, while another transmits these processed impulses to the brain where they are interpreted. 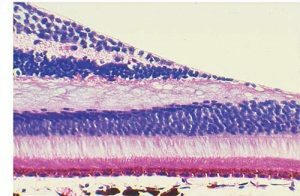 OCT testing is like having an optical biopsy of the retina; it provides excellent visualization of these layers of the retina, and aids greatly in the diagnosis and treatment of retinal disorders like AMD. Not every patient needs an OCT test. In Ontario OCT testing is covered by OHIP.